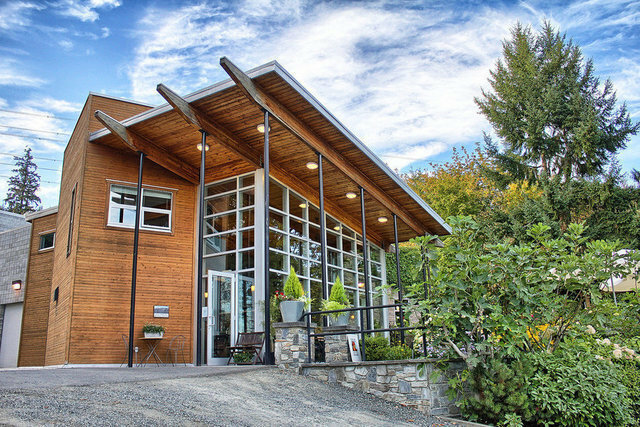 Averill Creek is a 46 acre, family run estate winery on Vancouver Island in the increasingly popular Cowichan Valley wine region. The winery specializes in producing benchmark quality single-vineyard wines. Since Averill Creek’s first vintage in 2004 the production has stabilized at an average of 6,500 cases per year making Averill Creek the largest estate winery on the Island. Built into the side of Mount Prevost the 8,300 square foot winery is a state of the art, gravity fed construction where pumping is not required to move wines from one area of production to the next. The winery has a total capacity of producing 15,000 cases per year. In addition to the winery’s manufacturing areas, there are guest facilities which include a tasting room, patio seating area, kitchen and dining room. The winery can comfortably handle up to 100 guests at a time. The tasting room, bistro and boutique gift shop are open during the tourist season which can usually run 8 to 11 months out of the year depending on weather. The Cowichan Valley has become well know for its culinary attractions which are focused on the local, slow foods.